Empty seats are something Ryerson’s hockey teams have been used to this season. 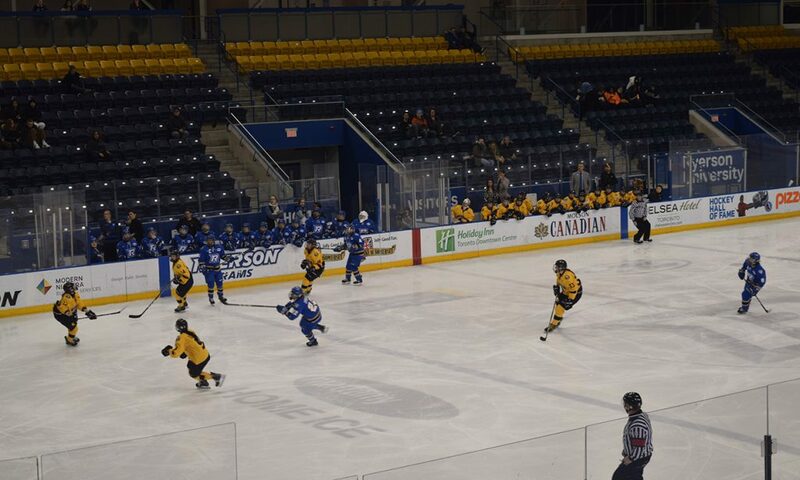 Both the Ryerson men’s and women’s hockey teams sit last in attendance in Ontario University Athletics (OUA). According to OUA statistics, the women’s team averages 17 fans per game, while the men’s team averages 24 fans per game. Ryerson’s is the only men’s team in the OUA to average fewer than 100 fans per game. Laura Ball, a fourth-year player and assistant captain for the women’s hockey team, said that the team does not have high expectations when it comes to attendance. “Not having a large turnout for games is something we are used to and not something we expect anymore,” said Ball. Steven Harland, a second-year forward for the Rams, said it is disappointing to not have many fans come out, but feels there are ways Ryerson athletics could get more fans out to games. In 2012, Ryerson Athletics started a promotion for men’s hockey, selling beer for $3 at Thursday night home games. The success on the men’s side also led to the strategy being implemented for the women’s team as well. However, this season no such promotions have taken place for either team. The Ram Pack is a dedicated group of Ryerson students that attends games regularly to cheer on the various sports teams at Ryerson. Christian Steeds, head of marketing for the Ram Pack, said that the lack of marketing for hockey in comparison to other sports at Ryerson has affected the attendance. “There’s more marketing put in place for the basketball games,” said Steeds. Statistics would appear to back up Steeds’s claim. The women’s basketball team has the best attendance in the OUA and the men’s side has the fourth best. Meanwhile both the men’s and women’s volleyball teams have the best average attendance in the OUA, with each drawing just over 370 spectators per game. Ball said she understands why other Ryerson teams draw in a larger crowds. However, she believes that the women’s hockey team’s performances have helped make a name for themselves and done enough to attract fans. “Our women’s hockey team has taken the program to the next level by earning our spot as one of the top teams in the province and that’s something that I definitely think should be recognized, celebrated and supported on campus,” said Ball. When the marketing has been in place the teams have had good turnouts. Steeds said that was very noticeable at last week’s winter homecoming. 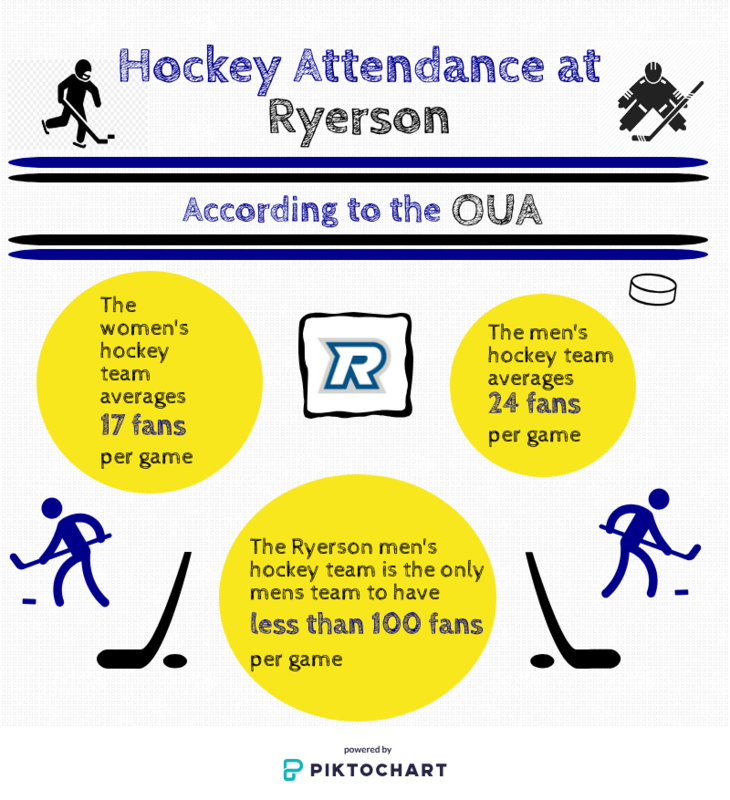 Attendance statistics for the Ryerson Rams Hockey Teams for 2019 (Nicholas Da Cunha/Ryersonian). Steeds also said that it comes down to a matter of effort, follow through and accountability on the part of athletics when it comes to promoting these teams. The players on both teams believe strong attendance would positively impact the team on the ice. “It would only be a positive change to have an increase in attendance and would only push our game to the next level,” Ball said. Harland echoed this sentiment, saying more fans would improve their game and make the whole game experience more enjoyable. The Ryersonian reached out to Carmelina Federico, director of sales and marketing for Ryerson Athletics for comment, but did not get a response in time for publication. Both teams will be playing this Saturday at the Mattamy Athletic Centre, with the women’s game beginning at 2:15 p.m. and the men’s at 7:15 p.m.